Wildfires last month killed 210 people in Victoria. The country’s greatest wetland, the Coorong near Adelaide, is drying up. And as it does, the sulfur in the exposed bottomlands mixes with oxygen in the air to form sulfuric acid mud that is killing aquatic life. Forests of Red Gum trees, hearty sentinels of Australia’s arid landscape, are dying. And crops across southeast Australia’s Murray-Darling Basin, one of the planet’s most productive food growing regions, are failing. Once prosperous rural cities are in decline, and suicides in farm families occur at a rate twice the national average. Winding across 400 miles of South Eastern Australia’s dry landscape, the Murray-Darling river system struggles to sustain much of the country’s agriculture. Due to the effects of drought and man, the Wakool River near Swan Hill no longer tops its banks (J. Carl Ganter/Circle of Blue). The brutal Australian drought has emerged as “The Biggest Dry.” This is no mere statement of hyperbole, scientists tell us. It’s what happens when a nation purposefully designed to use an enormous amount of water collides with a hotter and dryer climate that produces much less rain. Twelve years ago, the rain stopped falling in southeast Australia. The average temperature has climbed 1.6 degrees Fahrenheit since 1950, according to the Commonwealth Scientific and Industrial Research Organisation, Australia’s respected science agency. So much less rain is falling that surface flows across the region’s river valleys have been cut 40 percent. Over the past decade there has been so little water left in the lower sections of the Murray-Darling river system that for every four out of ten days, the Murray River doesn’t even have enough flow to reach its mouth in the Great Southern Ocean south of Adelaide. Outside the country’s borders, the crisis was hardly known until last year, when Australia’s one-million-ton rice crop failed. The crop disaster wrecked the economies of Deniliquin and other rice-producing towns, and caused world food prices to rise, prompting food riots in poor nations. The fires this year put the drought and its aftermath at the top of the global news. In “The Biggest Dry,” our team looks deeper at the consequences of a new pattern of dryer and hotter weather that climatologists in Australia assert is permanent. The drought is damaging the nation’s ability to feed itself, producing lasting changes on the land, pushing people out of their homes, aggravating long-simmering tensions between the government and Australia’s indigenous people, and causing mass extinctions. It is forcing the Commonwealth and four states to agree on new ways to govern in order to secure and manage water. Over US$12 billion in public funds has been committed to modernize infrastructure and change cropping techniques in order to conserve declining water supplies. Though it is the first industrialized nation to contend with the severe consequences of drought and climate change, Australia won’t be the last. The Biggest Dry is not only a global warning, it is a test of an industrial society’s ability to cope with new and dangerous conditions that threaten its ability to survive. Some Australians are convinced the nation is well prepared to meet the challenge. But the dry river beds, empty billabongs, fallow fields, and parched human spirits warn of a desperate struggle. It’s not at all clear that Australia’s response will be enough to overcome nature’s fury. For a complete list of credits, acknowledgements and other resources related to Circle of Blue’s coverage of “The Biggest Dry” please click here. I hope you are aware that Australian rainfall patterns seem to have simply reverted to what they were from 1901 (start of data) to 1949. It was 1950-95 that was probbaly unusually wet and yet we now consider those conditions to be normal. – how did country people cope with the rainfall levels of 1901-49? – What did our farmers do? – How much irrigation was undertaken? – What was the price of water relative to income? We really need to learn more about the past so that we can make informed judgements about what we should do in future. It is common knowledge that Australia is the driest hottest most inhospitable continent – with or without global warming. The aboriginees were ingenious in developing types of cultures and societies that could survive and thrive in such conditions. It will interesting to see what outcomes the ongoing water crisis will drive a transplanted Anglo-orientated (post) modern culture and society that derives a huge amount of its wealth from water intensive mining and agricultural practices. It seems to me that most of us as a planet are failing to look at natures natural processes to discover why in the first instance our agricultural & economic practices are the fundamental causes of our current dilema. In Australia before the white imperialism of europe savaged the Austalasian cultures of this part of the world, the practices of these indigenous people contributed the slow (50 – 60,000 year period) degradation of the natural lush habitats of this continent. In their ignorance they were insuring the slow destruction , degradation & change of their environment. Austalia slowly became the driest continent on earth. These practices could have been slowly changed and a reversal could have taken place if the “Smart Europeans ” had sustainable practices. They didn’t.. In fact their practices were far more devistating anf far reaching. Thank goodness our awareness has risen as this time of the world. The natural tendancy of moisture is to be trapped by roots in the ground and to be attracted by the leaves in high trees. In other words the more trees the more water. It keeps the water table high & the salt levels low. 1.Hardly any trees have been extensively planted back by any farmers, nor has the government encouraged replanting anywhere in any way that would truly be of substantial benefit. The conclusions that common sense comes to is replanting trees, even in places where trees might not have been before. Trees as we know are needed anyway, they in fact will have a large effect on green house gases. I would also like to comment in advance to anyone who might accuse me of oversimplifing it. Firstly, it is simple. Ecomomics has ruled the world for years. The rescources of the earth have been considered to be limitless and COULD COME CLOSE TO BEING if we use sustainable practices. Politics and the idea that government & business know whats best for people has effectively led the peoples of the world to where we are now. It is simple and if the Government & business with its financial PROFITS were to be lead to water you’d think it would be easy for them to drink. Secondly, Cutting trees down is expensive time consuming & dangerous, while its quite simple easy & cheap to plant a tree. In fact a tree does not need that much water to grow. and these plantings could be our future timber industry. Everyone should read and reread John McLean’s comment above. 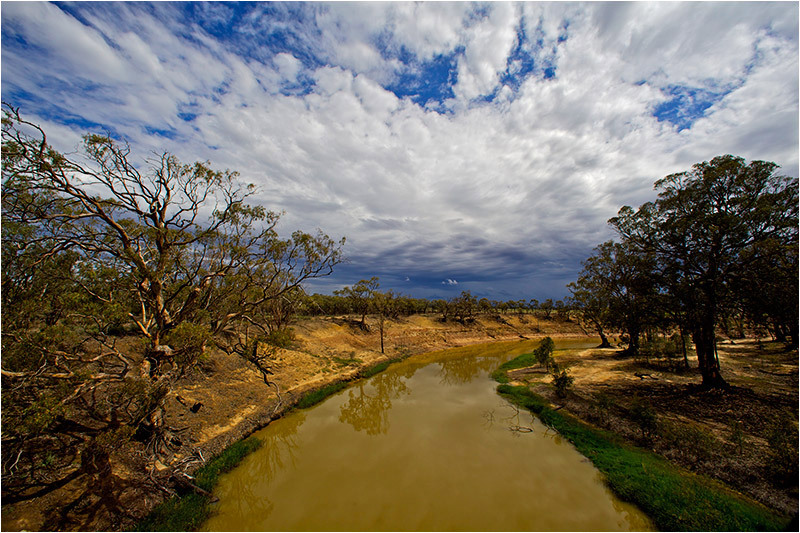 The Bureau of meteorology (Australia) have published data showing the average rainfall over the Murray-Darling catchment over the last 100 years or so. A glance at this, bears out what John McLean has said and in fact we are still in a privileged state relative to the earliest years shown by those records. The claim of the effects of Global Warming are a complete red herring. Even by the IPCC and CSIRO’s extravagant claims, Global Warming hasn’t advanced far enough to make any significant difference to the weather in these regions. It is just relaxing back through a cyclical pattern to the earlier periods well known to most farmers from information passed down from their great-great-grandfathers and later generations. This drought is no surprise to them. The problem is for those farmers in particular whose properties have been developed, with government encouragement, to depend on the large irrigaion allocations provided so generously by governments in the post war period, 1950’s onwards, in the years of very high rainfall. The lack of foresight was from those government agencies responsible for these allocations without any proviso to vary them according to rainfall and river flows. This constraint would have ensured that farmers were not to expect water to flow into their irrigation channels every year and would have lead to a different distribution of assets and farming programmes which would have included dry-land farming, which is how the rest of the farming population survives. This does require additional skills and specific planting regimes but crops can be grown almost continuously over a district with very little rain. There is of course a far greater area under dry-land farming than under irrigation. All farms may not produce every year, but so far our rural exports still lead the country in this important economic activity, as well as providing food for a population of well over twice that when the original irrigation licences were given out. Farmers must be doing something right! It is also noteworthy that the only industry sector which showed growth in the last two quarters of 2008 was the rural sector. Without it, the definition of recession would have been made much earlier. I agree that planting trees is a good idea for many reasons and farmers would be encouraged by a government with any foresight at all, to plant trees on all otherwise unproductive land of which there is quite a lot within the very regions of high agricultural activity. This could also add to farmer’s, often low, incomes. Finally, has anyone heard from the IPCC or the CSIRO to say exactly why and how carbon dioxide causes global warming? The fact is they can’t or won’t as I have been trying for over twelve months to obtain information from Penny Whetton’s group in Melbourne, the Climate Change Stream, on this very question and no one in the whole group can answer my simple questions! Very scientific indeed. All those peer reviewed papers they keep talking about avoid any reference to the basic physics of the Green House Effect. I wonder why? If any one knows, please contact me through these pages. The causes of south-eastern Australia’s longest, most severe and damaging droughts have been discovered, with the surprise finding that they originate far away in the Indian Ocean. A team of Australian scientists has detailed for the first time how a phenomenon known as the Indian Ocean Dipole (IOD) – a variable and irregular cycle of warming and cooling of ocean water – dictates whether moisture-bearing winds are carried across the southern half of Australia. The landmark new study explains the current record-breaking drought in south-eastern Australia and solves the mystery of why a string of La Nina events in the Pacific Ocean – which usually bring rain – has failed to break it. It also reveals the causes of other iconic extreme droughts in recorded history, notably the World War II Drought from 1937 to 1945 and the Federation Drought from 1895 to 1902, and challenges the accepted understanding of the key drivers of Australia’s climate. When the IOD is in its negative phase, a pattern occurs with cool Indian Ocean water west of Australia and warm Timor Sea water to the north. This generates winds that pick up moisture from the ocean and then sweep down towards southern Australia to deliver wet conditions. In its positive phase, the pattern of ocean temperatures is reversed, weakening the winds and reducing the amount of moisture picked up and transported across Australia. So the south-east misses out on its usual quota of rain. The study notes that the IOD has been in its positive or neutral phase since 1992, the longest period of its kind since records began in the late 19th Century. The team, led by Dr Caroline Ummenhofer and Professor Matthew England of the UNSW Climate Change Research Centre, details its findings in a paper accepted for publication in the journal Geophysical Review Letters. The team included researchers from CSIRO Centre for Australian Weather and Climate Research and the University of Tasmania. “The ramifications of drought for this region are dire, with acute water shortages for rural and metropolitan areas, record agricultural losses, the drying-out of two of Australia’s major river systems and far-reaching ecosystem damage,” says Dr Ummenhofer. “We have shown that the state of the Indian Ocean is highly important for rainfall and droughts in south-east Australia. More than the variability associated with the El Nino/La Nina cycle in the Pacific Ocean, the Indian Ocean Dipole is the key factor for driving major south-east Australian droughts over the past 120 years. “During this latest drought – the so-called ‘Big Dry’ – recent higher air temperatures across south-eastern Australia have exacerbated the problem.